Details: Valley Symphony Association Orchestra “The Music of Mozart: Selections from ‘Amadeus’” Sunday, February 24, 3pm Montrose Pavilion (1800 Pavilion Dr, Montrose, CO 81401) $5-$20 This winter orchestra concert highlights selections from the award-winning 1984 film, “Amadeus,” an opulent tale and fictionalized biography of Mozart. 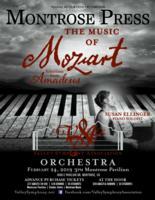 We welcome back soloist Susan Ellinger, who will perform her wonderful piano artistry on Mozart’s Piano Concerto No. 20 in D minor, which played over the film’s closing credits. The Montrose Daily Press is the concert partner for this event. Broadcast sponsor is Cherry Creek Media. For this very special concert, an artist’s reception immediately follows. The VSA is an all-volunteer performing arts organization in its 48th season. Its musicians, who range in age from 14-92, hail from throughout the Western Slope. For more information and tickets, visit ValleySymphony.net and on Facebook @valleysymphonyassociation.